Our first morning in Ireland started out with breakfast and the best coffee of my life. It was in a little pot, so I put sugar cubes in my cup, poured hot coffee over them and added half a cup of milk just the way I like. and it was still hot. Ya’ll, it was like angels singing. 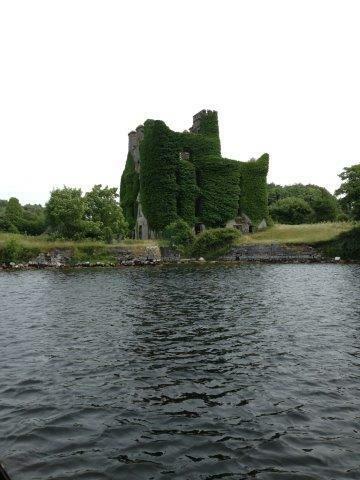 Then we headed off to a river and lake tour aboard the Corrib Princess. 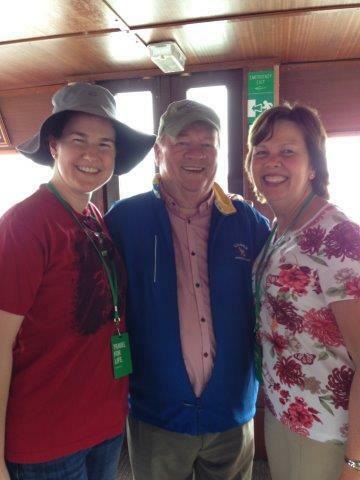 Our tour group joined a boat half full with lovely Irish folks. Speaking of angels singing, one Irish gentleman, Dennis Clare of County Clare, sang Irish Ballads as we traveled up the beautiful river. It was transcendent. Until they asked our group to sing. To say we were horrified is putting it mildly. Not a strong singer in the bunch and geographically diverse to boot, we had a hard time coming up with a song we all knew. We quickly chose America the Beautiful and it was a bit of a train wreck. There are some really high notes in there. They did not ask us to sing a second song. Dennis agreed to take a picture with us and then picked it back up and we listened to more beautiful singing while enjoying the view. There was a castle with vines growing all over it. You could practically see the fairies that lived in the little glens off the river. 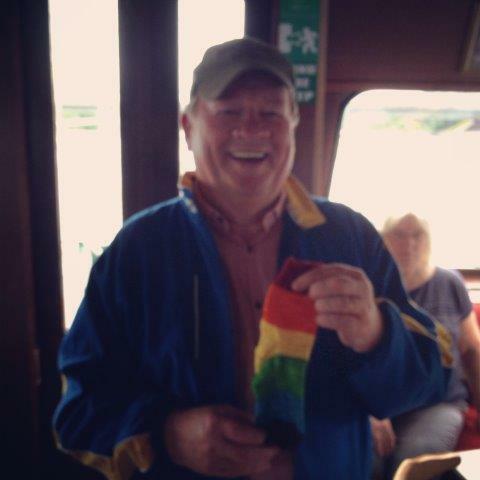 As I was getting off the boat, Dennis was gracious enough to take a quick sock pic; I gave him a hug and he wished me luck in whatever road I go down. He is everything I thought an Irishman should be and I was completely charmed. * My humble apologies to Dennis if he’s from a different county. It sounded like Clare to my Texas ears. I am sure his last name and his county were the same. You sang?!? HAHAHA!!! Dennis looked to be a great sport! Carrie recently posted..I might be married to the law but it’s a known truth “I” am the law and if I had no hair you could call me Kojak. Sounds divine, especially the best coffee ever! That sock is looking pretty too! Pumpkin recently posted..What is up with this Fall thing anyway?